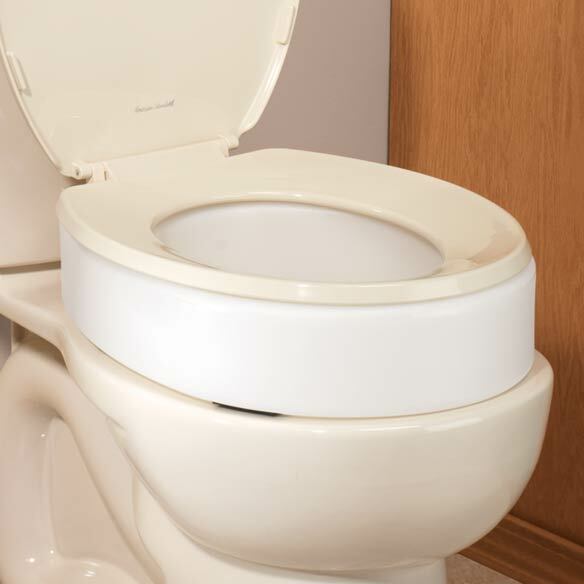 This quick-install toilet seat riser elevates your existing toilet seat, raising it 3 ½” to make sitting and standing easier and more comfortable. 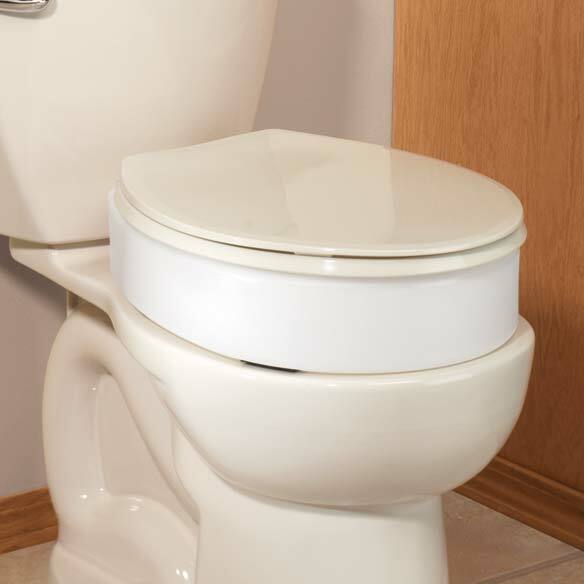 The white toilet riser is designed to be installed beneath your existing seat, providing a raised toilet seat is ideal for convenience and comfort. With this handy elevated toilet seat, you’ll no longer have to struggle with sitting on the toilet or standing up after use. A toiler seat riser is ideal for anyone dealing with chronic pain, joint stiffness, and other common complaints, as well as for aiding in recovery after surgery or other medical procedures. The seat riser supports up to 300 pounds. Options include a standard toilet seat lifter and elongated style riser. Standard riser is 17” x 13”; elongated seat lifter measures 19” x 13”. Had both knees replaced & this seat gives me a better height to sit down and to rise from. Much better design than our previous one and blends onto commode much better. Very sturdy-have had one for 5 years.Looks great, like a part of the toilet.However,it has NO hinges,so you cannot lift it to clean under it. For that reason,I prefer to spend double amount on a hinged one. Looks built-in and is very good quality.It is only 3',NOT 3.5".I bought three more hinged ones for all my bathrooms, and we love them.Terrific for seniors,tall people, and a must after a hip replacement or stroke.Hinged ones are perfect. I purchased a different one for my senior Mom because the toilet in my apartment was too low for her. I did not know what she was talking about until I started to use it. So, after it old, I tossed it. I went for few weeks without replacing it and I was suffering big time. I knew what she meant about the seat being too low. Once I finally replaced the old one this one I feel so much better. I can no longer sit "low" on a toilet seat ever again. People think that these risers are just for the elderly, they are not. If you are tall as I am,these things are a must. I am a retired RN. I had purchased 2 other styles of a riser from a local med supply store. Both were flimsy, unstable, difficult to clean. This is fantastic! As a retired RN with knee, hip and back problems, this riser makes toilet use comfortable, and safe. And because it works with you toilet seat, including the lid, it blends in quite nicely. I soundly recommend this product! Price range is equal to med supply stores. This was a good price and I knew I needed one, but was putting it off. I figure not many people talk about products like this, but I wanted people to know this is a good product. It is sturdy and you can use your own seat with the long bolts included. There are no big gaps like I feared to make cleaning a headache. It cleans up nice and is very stable. The height is perfect for me, 5'9" that it does not feel elevated. Glad I bought it! For Medical reasons, I need to sit higher. This product just looked ideal and more quality than the others. can use the toilet's own seat that can be closed when not in use. I had one of these units some yrs. ago for my husband, now it's my turn to have a raised toilet seat. I did not want one that has to be taken off & on, this is much easier. To keep clean is very easy also. Currently have one in guest bathroom, but am moving & wanted 2 new ones for the new house After having both knees replaced & being 5'9" tall, this is definitely a lifesaver! NEEDED A NEW ONE AND THIS ONE HAS A LID. My husband has a really hard time raising himself up off the toilet, and this is just exactly what he needs. Should make his life a little bit easier! I like that we can use the same toilet seat. Thank you. I checked the reviews and they were favorable, and I like the fact that there is a lid. My husband and I both need a higher seat. I have tried this seat at a friend's home and I think it will work for us as well. Since we have several bathrooms we decided to try them on at least two of them. To help my husband with bathroom use to get up and down easier. Have used one for years, just renewing. Only one that accommodates a normal seat and lid. It is simple, has no handles. I had these in my other apartment and loved them. However, when moving to another apartment within the same building I simply re-ordered. Cannot do without them now. They are wonderful. Makes going to the bathroom so much easier. Have one just like it but is now cracked. My legs are too short. Need a portable "one" for powder room Easy access from outdoors. I love the idea of being able to use my existing lid. Buying it for an 82-year-old lady moving into senior apartment. It only has a regular toilet & she needs the extra height. I bought one for my toilet 2 years ago when I had my first knee replacement. It is wonderful! The apartment we just moved into has a very low toilet set. Other risers have been unsatisfactory. Looks a lot safer than most, also very good reviews. Been looking for a srat WITH cover. Very important to have cleaner air. existing toilet is very low. To assist my elderly mother! Have one and want another one for 2nd bathroom. Husband has trouble getting up from the seat. Is hardware included and how does it connect??? to short people and children when their feet don't touch the floor when they sit. It has worked very well for us. It sits on top of the bowl and comes with very long screws that thread through the lid, seat riser and through the bowl and tighten with a bolt. I am female and did it myself. yes, all hardware included! Easy to install after you get your old seat off! Is the riser seat soft or hard plastic? BEST ANSWER: Its hard and your regular seat mounts on top. Try it, you will like it. Do you work with Blue Cross Blue Shield Medicare Advantage Plans? BEST ANSWER: Thank you for your question. Insurance cannot be accepted as a payment plan. You would buy it up front and then forward the receipts to the insurance company. We hope this information will be of help to you. Will this fit standard American toilet seat camol ? BEST ANSWER: Thank you for your question. This will fit all standard toilets. We hope this information will be of help to you. What is measurement between the bolts so I will know if it fits my commode bolt holes?? BEST ANSWER: Thank you for your question. The measurements between the bolts are 4 7/8” . We hope this information will be of help to you. where do i find a new toiliet seat that fits on top of this riser. have to replace the old toiliet seat and get a new one cannot find toiliet seat that has the holes that match up to the riser and the old toiiiet also a seat that wil take the long bolt or screw that came with the riser? BEST ANSWER: Thank you for your question. Unfortunately, we do not sell toilet seats we just have the risers. We hope this information will be of help to you. will this riser work on RV toilets? BEST ANSWER: Thank you for your question. This will work for any standard size toilets. We hope this information will be of help to you. How is this item attached to base? The riser comes with two long "bolts" and "nuts". Very easy installation. Remove seat/lid from your commode place the riser on it then place your seat/lid on this and put the long bolts through and put the nuts on. Very easy, takes about 10 minutes. The riser is attached to the base by two long bolts that pass through the extended hinges at the back of the seat assembl;y to the original toilet base. Easily attached with the extra long screws that come with the toilet seat. Love this as you can use your existing toilet seat. Using the same holes/bolts that are used to attached the current seat. Just longer bolts. does it include some hinges to lock onto the toilet? BEST ANSWER: One has to remove the toilet seat & lid - wing bolt & screws; then place the raiser on the toilet, seat & lid on top; use the supplied longer screws & wing bolts to secure into place. most difficult part was loosening the original bolts & the cramped quarters of the room. No, but it includes a notch on the bottom that effectively attaches the riser to the toilet.It works very well, and I like a lot. It is bolted on to the toilet with the supplied bolts just like the regular or normal seats are fastened . How far apart are the hoes for the attachment screws? BEST ANSWER: Thank you for your question. The toilet seat riser fits any standard toilet. We hope this information will be of help to you. The holes in the seat line up correctly with the holes in the toilet. My toilet is a new one and a water saver (oblong). How do I measure toilet for fit? BEST ANSWER: Thank you for your question. You'll want to measure the toilet bowl width and length on top. We hope this information will be of help to you.